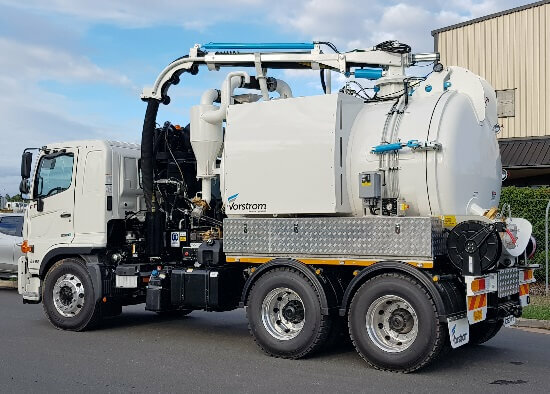 Setting a new benchmark for productivity and efficiency in industrial vacuum projects across Australia, the Vorstrom TRD1600 – 8000 industrial vacuum truck is unequalled for performance and low operating costs on excavation and trenching works. Fitted with a 1600CFM vacuum pump, 8000 litre barrel capacity and additional 1200 litre water tank, this model is designed to support the safe and efficient collection, storage and transportation of liquid wastes, sludge, mud as well as regulated and nonregulated waste. Vorstrom’s range of industrial vacuum equipment are recognized for their easy operation, dependability and capability to handle a wide range of jobs with ease. Due to the rugged and compact design of this unit, it can work on a variety of jobs from complex construction projects to regular sewage maintenance. See FULL FEATURES tab below. – 8000L Waste Tank capacity with tipping capability. – Full opening rear door hydraulic operation with 4 x hydraulic positive lock door locks. – Hydro excavation / pot holing capabilities – 5000 PSI @20L flow per min. with, 40 metres of hose on a retractable wheel, quick release fittings, attachments including turbo heads and hand gun. – Hydraulic, 300-degree Rotational Boom for 150mm (5 inch) Hose. Hose 15metres in length with remote control and attachable pendent control. – On Board Weight Monitoring System – Accu-weigh system, axle-based weight. 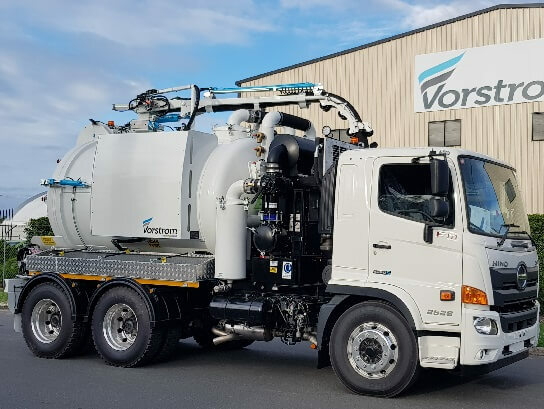 Vorstrom is constantly leading the way delivering on the needs of industrial cleaning contractors, providing more operating features and than any other manufacturer. We have relentlessly put emphasis on safety and durability by combining optimum quality, compliance and testing standards in everything we do.